BD Diesel Black FleX-Plate - Dezod Motorsports Inc - Home of the automotive performance enthusiast since 2002. When additional horsepower and torque are added to your diesel, you run the risk of cracking the stock flex plate. Designed to handle up to 1500 ft/lbs of torque, the new Black Oxide Coated Flex Plate is corrosion resistant to prevent hydrogen embrittlement, billet machined and precision balanced for ultimate strength. 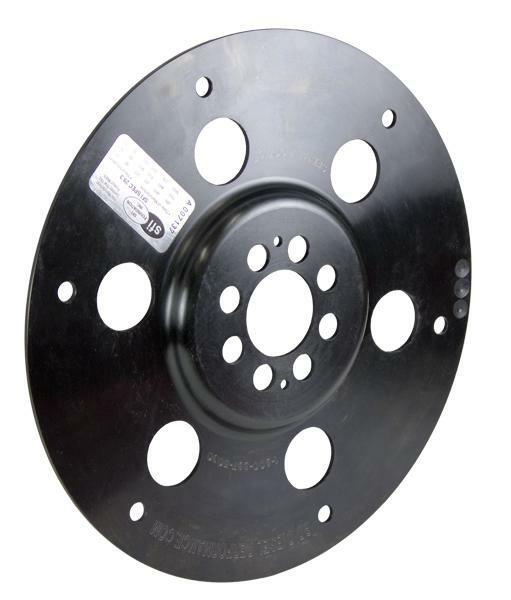 This flex plate is twice as thick as stock and has passed the stringent 29.3 SFI testing, making it legal for use in race sanctioning bodies specific to High Horsepower diesels. These units are a direct bolt-in and fit any OEM or aftermarket torque converter. Only Replace the Weak Link! Unlike other manufacturers, we do not require the replacement of the entire flywheel assembly, which is costly and unnecessary. In fact, most flywheel-flex plate assemblies have too little axial thrust (the inability to flex), making them just as susceptible to cracking as a stock fle xplate. Save $$ replacing only the flex plate and not the entire assembly.